Some poor sod is having a bad PR day. 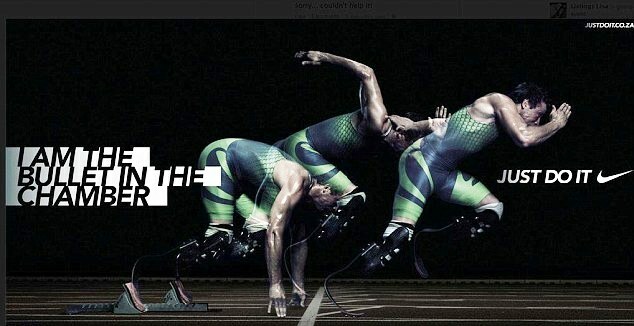 Turns out Nike’s advertising campaign featuring Oscar Pistorius likens the athlete to a bullet in the chamber. Problem is Pistorius has been accused of releasing four real bullets from the chamber of a 9 mm pistol and killing his girlfriend. You can’t escape news of the Valentine’s Day shooting that left Reeva Steenkamp dead. And it’s not just fodder for the tabloid media: mainstream news have reports daily about the shooting, rife with speculation about Pistorius, who grabbed headlines as a Paralympian and Olympian who runs with aid of blade-like prosthetics. The Nike campaign is loaded with war metaphors: his body is a weapon. He wages war. I was born without bones below the knee. I only stand 5 ft 2. But this is the body I have been given. This is my weapon. How I conquer. How I wage my war. This is how I have broken the world record 49 times. How I become the fastest thing on no legs. This is my weapon. This is how I fight. I’d hate to be the copywriter who wrote the script for the campaign that glorifies war, weapons and warriors. But then, I’m just a girl. As for Pistorius: I am a bullet in the chamber. Just do it. This entry was posted in authenticity, censorship, ethics, journalism, Native Science, news bias, science, science communication, writing and tagged native science, rhetoric. Bookmark the permalink. I am in India for a working visit. AS you probably know, violence against woman is a monumental, apparently growing problem here. There are many reasons for this, including the breakdown of woman positive traditions. Of course, being a female has long been difficult for many women in India. Now the cultural environment seems increasingly frightening, according to many young women with whom I have spoken. Young men are also struggling. All seems in flux, and mixed messages are everywhere. Competition and aggression are on the rise, and with them perhaps, gender violence.